Today is National Pizza Day, and what better way to celebrate it than to take a look at how far vegan pizza has come these last few years? From something we vegans would have to sadly make at home on pitta breads (or shyly ask for without the dairy) to being widely available nationwide, vegan pizza is on the up and up. Two and a half years ago only one national chain, Pizza Express, provided vegan pizza on the menu: today it’s a whopping four, with more and more local chains and independent restaurants stepping up to the mark. While the fan-submitted Pianta started the trend back in 2014, 2016 saw MOD pizza, The Stable and Zizzi bring out their own vegan offerings, with the well-received addition of vegan cheese. Italian restaurant chain Zizzi’s pizza was so well-received, in fact, that they recently reported a 150% increase in sales of its vegan mains. No one can deny that 2016 was the year of the vegan pizza, which has in turn seen more and more vegan options added to the menu. While we’re still waiting on the frozen pizza revolution (so far only VBites and Valsoia offer ready meal pizzas, found in Holland and Barrett and/or Ocado) the time of the vegan pizzeria and late night takeaway is at hand. Here’s 15 of the best places to get vegan pizza. This family-run veggie takeaway and restaurant business is number one on many a list. Not only is their vegan pizza available at an affordable price, it’s also exactly the sort you’d get from the best takeaways: cheesy, deep pan goodness with a Pizza Hut crispness to its bases. Birmingham dwellers may also consider similar establishments like Veggie Lounge in Wolverhampton and Smethwick’s Veggie Hut. London has so many mouth-watering options for vegan pizza: Firezza, Village Pizza and Basilico will even deliver vegan cheese pizza to your door. But for unsurpassable excellence, a feast of handmade toppings and the authentic Italian thin base pizza, vegan restaurant Fed wins every time. This establishment came to fame last year as ‘Europe’s first vegan pizzeria’. Many Italians scoffed at this, having a fair few vegan joints of their own already. But it may well be one of the first places to offer a scrumptious vegan stuffed crust pizza. Does it get any better than this? If you’re pure craving a vegan haggis pizza, Stereo is the place to be. The trendy vegan bar also offers a delightful pesto alternative. While they’re not a takeaway business, Boom Pizza a few streets up will deliver vegan cheese pizza to your door instead. The range of vegan toppings including tofu, vegan chicken and pepperoni is only rivalled by Fed By Water’s. This veggie Italian restaurant joins an ever growing Scottish vegan scene you’d be lucky to find outside of London. One of the best vegan restaurants in the country sure goes go to town on their pizza, with vegan Cajun chicken and four cheese pizza being a firm favourite. This veggie pizza bar didn’t have any vegan options until the local vegan group got involved. Now the base is vegan and topped with Violife vegan cheese on request, as well as hummus and other fresh veg delights. Their free olives and classy cocktails among the ambient Moroccan vibe make it one of Huddersfield’s best vegan hangouts. It’s not often you find a roving pizza company, but this Welsh outfit can often be found at vegan fairs across England and Wales. Let’s hope for a permanent location – one can never have too many vegan pizzerias. Zizzi’s pizza doesn’t skimp on the vegan cheese and is available in basically every city all over Britain. That means the majority of you can happily Deliveroo their menu straight to your abode and voila, takeaway vegan pizza! This pizzeria really knows how to define a vegan ‘meat feast’ and their underground unlit ambiance is charming. The expanding chain is a great place for a simple vegan cheese pizza and a cider. The vegan pizzas may seem relatively plain compared to the great selection already expounded, but it’s great to see a non-vegan pizzeria offering tasty vegan garlic breads and bases on top of the veg-heavy pizzas. 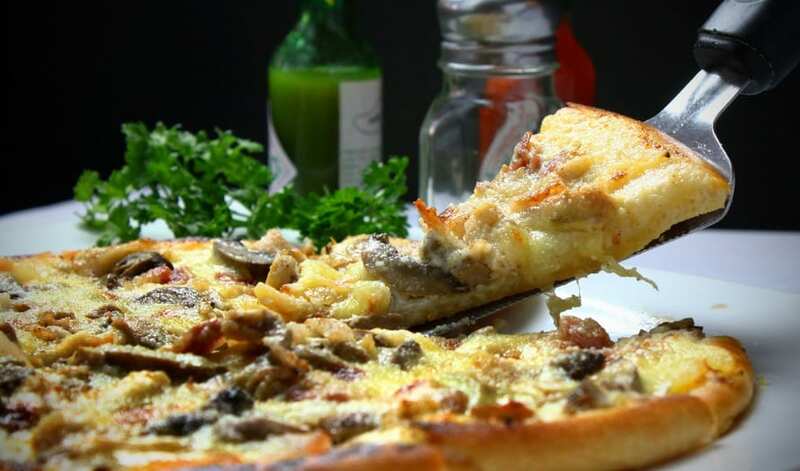 Everyone talks up Ecco Pizza in Leeds but did you know that there’s a cheaper alternative? You can eat in or have it delivered, perfect for students in the area. Their range of curries also means you don’t have to choose between Indian or pizza again! Set to be Manchester’s first eatery to deliver vegan pizza, this recently re-opened pub could be what we’ve all been waiting for. Be sure to influence the staff early on and get the toppings you want to see! Ever wanted to eat vegan pizza in a country pub? Now you can! Is It Time To Let Dairy Fail? Next PostIs pairing wine and food all it’s cracked up to be?